We stock an extensive range of haberdasahery supplies - from Gutterman threads and machine embroidery threades to bra extenders and other day to day necessities. 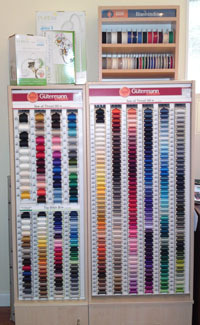 We have a selection of DMC embroidery thread and also buttons, ribbons, bias binding, zips and elastics. Included in the stock is a basic range of quilting needles, threads, vilenes and velcros. 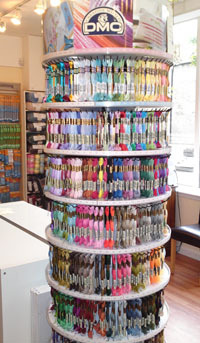 We supply Robin, Wendy and Twilley's of Stamford yarns and have a wide selection of knitting patterns in store. The wool ranges from a very acceptable economy range of Acrylic through to Mohair and if you would like we can even order Alpaca or Bamboo! 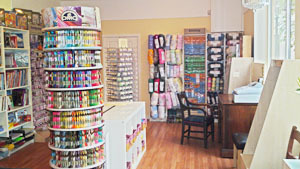 We have a wide selection of Knitting accessories and if we haven't got what you want in stock we will order it for you. Sheila is happy to try and help - two heads are usually better than one! We have a basic selection of card making equipment - including aperture cards in a variety of colours and aperture shapes. Envelopes in a variety of sizes and colours. We have both die-cut and uncut decoupage sheets and stick on decals for that special greeting. We have a selectioin Daler-Rowney art supplies including Paints, Acrylic, oils and watercolours, inks , brushes and papers for acrylics and watercolours and boards and canvases for oils. We also stock a range of easels, boards and storage boxes. 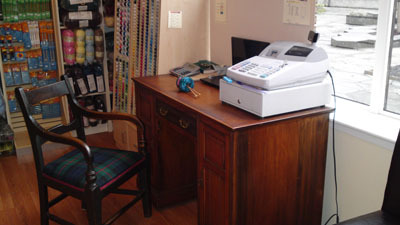 We are ordering regularly from Daler & Rowney so any special requests can usually be accomodated.